Virginia experiences a humid subtropical climate, which means hot, humid summers and mild, wet winters. Virginia gardeners plant shrubs to add color, ornamental interest or a privacy screen to their landscapes. If you live in Virginia, select shrubs according to general culture, bloom time, flower color, mature size and intended use. The buttonbush (Cepalanthus occidentalis), a deciduous shrub in the Rubiaceae plant family, ranges from 5 to 12 feet tall and 4 to 8 feet wide. The buttonbush blooms June through August, featuring fragrant white flowers that give way to round fruit. This low-maintenance shrub prefers moist soils in partly to fully sunny locations. Virginia gardeners plant the buttonbush along moist woodlands, swamp margins, stream banks and pond margins. The sweet pepperbush (Clethra alnifolia) belongs to the Clethraceae plant family and naturally occurs along Virginia stream banks. This slow-growing shrub typically grows 3 to 8 feet tall and up to 6 feet wide. Flower spikes appear in July and August, featuring fragrant, white blossoms that give way to ornamental seed capsules. The deep green leaves turn vibrant yellow in the fall. This shrub prefers acidic, wet soils in partial shade positions. The sweet pepperbush works well in shrub borders, foundation plantings and butterfly gardens. Tatarian dogwood shrubs (Cornus alba) feature bright red foliage that adds year-round color to Virginia landscapes. Mature shrubs form colonies 3 to 6 feet tall and 3 to 6 feet wide. Borers and Japanese beetles sometimes infest injured plants. This Cornaceae family member prefers rich, moist soils in partially shady to fully sunny locations. Non-showy, white to yellow flowers bloom in May and June, giving way to attractive, white fruits. The tatarian dogwood generally works well as property screens, shrub borders and hedges. Cornelian cherry dogwoods (Cornus mas), large shrubs in the Cornaceae plant family, feature star-shaped, yellow blossoms in March, followed by edible, red fruit often used in jams and syrups. This shrub features ornamental, grayish-brown bark and dark green leaves that turn a non-showy, purple shade in the fall. Mature shrubs grow 15 to 25 feet tall and 15 and 20 feet wide. This dogwood variety likes rich, moist soils in partly to fully sunny locations. Virginia gardeners often use the cornelian cherry dogwood in shrub borders, woodland areas, foundation plantings and property screenings. The border forsynthia (Forsythia x intermedia) belongs to the olive plant family (Oleaceae) and generally performs well in Virginia lawns and gardens. This quick-growing shrub forms mounds ranging from 4 to 6 feet in both height and width. 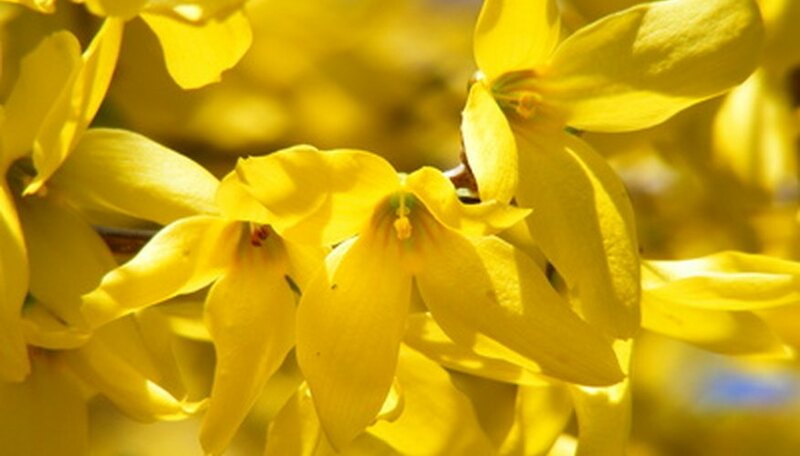 The border forsythia displays vibrant yellow flowers in March and April. Phomopsis gall sometimes occurs in humid Virginia climates. This shrub prefers acidic, moist soils in locations that receive plenty of sunlight. The border forsythia shrub typically performs well in border backgrounds and property screenings.